Run your business. We finance it. When starting a new business, there are investments that can slow down your growth and impact your success. Building a website is one of them. For almost everything in life, you can get credit. But for the web, you can't. We’ve decided to change that, to make things easier for you. A little credit can change a lot. 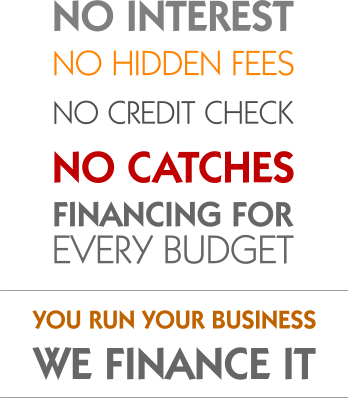 We present the world's premier solution for financing your online business. In just a few easy steps, you can start running your online business within days instead of months, and without fundamental financing investments. Just create an account and your account manager will contact you shortly for a discussion. By working with our service you can pay in two primary ways, whichever will best facilitate the growth of your business. Upfront payment: Pay for the project prior to its delivery. Sites up to 8.000€ can be financed for up to 6 months. Sites up to 20.000€ can be financed for up to 12 months. Sites up to 50.000€ can be financed for up to 24 months. Sites over 50.000€ can be financed for up to 36 months. A detailed installment plan will be determined for each application. During the discussion with our project managers, please present all your information before you ask for credit. Submit as much information about your business as possible and describe your project in detail. This demonstrates that your business intentions are serious, and that you are stepping into a well-planned enterprise with strict expectations and some solid preparation behind you. Have all your website content ready before you apply for credit. A clear, professional project description is also important when applying for credit. If you do not have a project description, our project managers can help you to create one for a very reasonable fee. If you do not have a website design yet, we can help you find a good designer or another professional solution. We don't ask for your credit score, nor do we perform a credit check. However, we reserve the right to refuse financing, at our sole discretion. If your initial discussion with our credit manager isn't convincing, and if you don't have your website content and design ready in advance, your request is likely to be declined or, at the very least, you will have to pay in higher installments. We provide you with a valuable and expensive product. We expect you to understand that our credit program is not a vehicle for financing your experiments.